The following is the second and final part of our two part post on inflation. The above quote from Sun Tzu’s The Art of War carries quite profound implications, not just for military applications, but for life in general. The better’s one grasp of the facts of reality, the more efficacious one can be at using that knowledge advantageously. For Sun Tzu, having a clear understanding of both his and his opponent’s army allowed him to best exploit the opportunity sets available to him in battle; the same holds true for investors in the marketplace. As investors, we are primarily concerned with the transaction price of our investments. The price at which we enter and exit investments will greatly impact our rates of return, and return maximization is the goal (within the context of a given risk tolerance). As Warren Buffett famously stated “the price you pay determines your rate of return.” Inflation, as we know, affects prices, and thus understanding its presence (or lack thereof) is noteworthy for investors. In economic terms, a money-price (that is, the price of something expressed in units of currency) has two components to it, a “real” component and an inflationary one. We can think of the real price as one that is fundamentally justified – meaning one that is set by economic actors within a market economy – and the inflationary one driven by changes in the money supply. The summation of these items comprises the nominal money-price, which is that which we actually observe. This holds as true for a gallon of milk as it does for the yield on a bond. Well, breaking down asset prices into their subcomponents can make it easier to analyze the value proposition of an investment. Deconstructing an investment’s valuation could potentially allow us to express a view on both the fundamental and/or inflationary subcomponents. Thus, profit seeking action may be possible where otherwise it was not. For example, if one thought an investment’s fundamentals were improving and the inflationary environment were stable, then one could more confidently invest at relatively high valuations and potentially profit as long as those assumptions held. In my view, which is by no means unique, there is currently a large inflationary component embedded in the nominal prices (i.e. valuations) of financial assets, and the cause is quantitative easing (QE) monetary policies (see Part 1 for my reasoning). Thus, so long as QE policies are maintained, their lingering effects on prices should persist as that liquidity remains trapped (willingly or not) within the financial system. However, financial markets and the “real” economy are integrated; rising and falling asset values have real world ramifications. Thus, QE’s impact may not have been isolated to the inflationary component of valuations. It may have had a real one as well, as a drag on economic growth (assuming that QE has been influential in lowering interest rates, which is debatable and outside the scope of this article). To this end I will first reference some more interesting work by Dr. Hunt. Dr. Hunt poetically contends that “as the tide of QE goes out, the tide of inflation comes in. And the more that the QE tide recedes, the more inflation comes in.” He believes that accommodative monetary policies have disincentivized companies from investing in their business for future growth, and thus higher rates should stimulate investment and (eventually) economic growth. In financial lexicon terms, it’s about reestablishing a hurdle rate for investment as Stanley Druckenmiller noted. I wholeheartedly agree with his view. 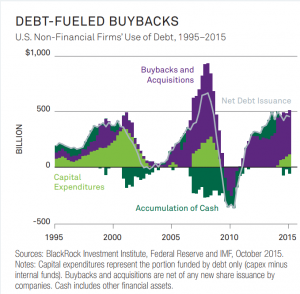 As the chart below illustrates, US companies have primarily used debt to repurchase their shares and other companies rather than on capital expenditures (capex). It often seems to me that people forget that debt must be repaid (and refinancing is a form of this); even at 0% borrowing costs, principal must be repaid. Capex projects generally facilitate debt’s repayment, as projects are expected to boost future cash flow, while share buy-backs do nothing of the sort. Thus higher interest rates could force companies to take a more thoughtful approach towards deploying borrowed funds, squandering less and expanding production more. An analogous situation may also be occurring on a personal level. It is generally believed by economists that lower interest rates will induce people to increase (or pull forward) their spending, as the incentives to save are lessened. This theory (in part) underpins QE and a lot of other mainstream economic thought. While such a theory may seem logical on the surface, I find it to be an unfounded assumption about human behavior. Could QE’s demise provide a tailwind to the real component of asset valuations? If so, which impact will be greater, the negative inflationary one or the positive real one? After all, we investors only care about the net: nominal prices. People, corporations and (thus) economies operate at their best when confidence in their ability to predict the future is highest. Omniscience is not required, but the more stable/predictable the economic lanscape, the easier it becomes to plan long term. Like a building, markets are most stable when built upon a firm foundation. The foundation for markets is price and valuation. Think of inflation as analogous to mixing air into concrete; the greater the proportion of the former, the weaker one’s formulation becomes. The further away from fundamentals valuations drift, the more susceptible they become to changes in liquidity. To put this in value investing terms, inflation lowers the margin of safety in markets. Thus, I contend, that QE has been a (highly) destabilizing market force in the long term. 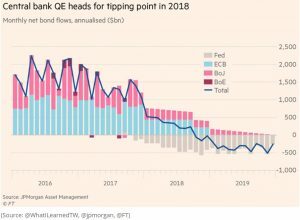 What my view suggests is that economic growth, market stability and, ultimately, prosperity necessitates higher interest rates and a removal of the inflationary QE liquidity. Market economies – the most successful types in history – are best built on stable foundations of transparent and fundamentally justified prices (as determined by economic actors freely transacting), that is with valuations as close to “real” prices as possible. Clouding economic actors’ perception of these prices with inflation distorts the efficient deployment of capital. Perhaps it is no coincidence that the strength of the current recovery has paled to its historical comparisons; prices today have been clouded by central bank interventions. Let us not forget that QE was an experimental policy, and there’s no shame in either experimentation or failure (both are in fact laudible!). However, changing the dialogue to fit the outcome is dishonest at best. The quicker the extraordinary monetary policies are unwound the better off we’ll be in the long term. Thus, as the various central bankers around the world begin to unwind QE, the question of whether or not investment fundamentals are strong enough to weather a deflationary valuation environment is an important one. The deflation will not occur evenly in time and magnitude. Capital will flee first from those most acutely affected towards other deemed to be more insulated. Thus, presumably the U.S. Treasury bond and mortgage-backed securities markets sit at the front lines, though markets are complex and investor behavior difficult to forecast. The debate around this is likely to be fierce and stakes potentially high. While certainty with respect to how markets will respond to QE’s demise (if it is even seen through) may be elusive, this (painstaking) exercise should help us better know our enemy – asset deflation; and so we, like Sun Tzu, need not fear the result of the ensuing battles. After all, knowing that a spade is a spade can be quite useful to an adept gardener.